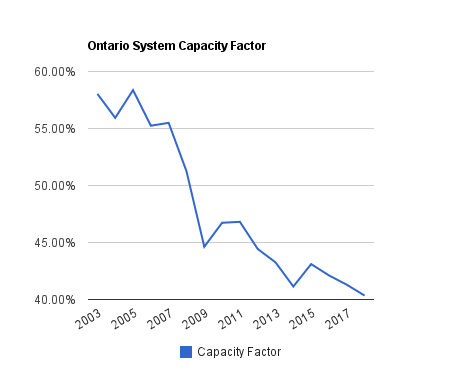 The Ontario government's announcement of a review of the Feed-In Tariff (FiT) program raised alarms among observer's of Ontario's electricity system. The review has been put in the hands of a senior bureaucrat from outside of the electricity planning process, de-emphasizing knowledge of Ontario's electricity system.. The government developed a survey and wrote; "All Ontarians are invited to participate in the review of the FIT Program and can provide feedback by answering an online survey or making a written submission at 2yearFITreview@ontario.ca." The government claims their review will "examine program rules and pricing to ensure the program remains successful and sustainable." The first Dalton McGuinty government established the Ontario Power Authority (OPA), primarily as a full-time planner of Ontario's electricity system (a history of planning, prior to that, is here). The most important document for guiding Ontario's operations was to be the Integrated Power System Plan (IPSP). The process to develop that document is for the government to provide the broad direction, through the Long Term Energy Plan (LTEP - I wrote on it here), and even more detailed direction in the Supply Mix Directive (SMD - I wrote on it here). The OPA's IPSP proposal is then to go to the Minister of Energy, and then onto the Ontario Energy Board for final approval. The first IPSP was submitted in 2007, but after some back and forth, died with the introduction of the Green Energy and Green Economy Act (GEGEA), which contained the structure that became the initial FiT program. Historically, the FiT program replaced professional planning of Ontario's electricity system. The latest Supply Mix Directive was delivered to the OPA in February. The SMD directed the OPA to "plan for 10,700 MW of renewable energy capacity, excluding hydroelectric, by 2018." The OPA then developed IPSP II, which is reported to have been delivered to the offices of the Minister of Energy at the end of the summer (prior to Ontario's election campaign). The OPA's 2011 2nd Quarter report indicated close to 6000MW either in-service of under development (3944MW wind, 1654MW solar and 221 MW of bioenergy). The recent, October 28th, OPA accounting of the existing FiT and microFiT programs, indicated application for 20,467MW, including 11822MW of wind and 8320 of solar projects. 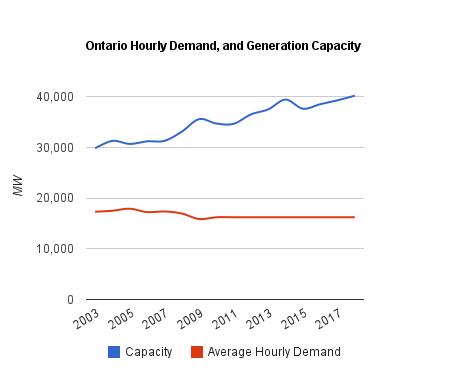 Proposals submitted so far nearly double the figures the system is being planned to accommodate, offering up the scenario where long-term planning of Ontario's electricity system is once again cancelled by external, non-expert, renewables programs. The net impacts on consumers of these policies is poorly understood in most jurisdictions, but probably none more so than Ontario. The guaranteed purchase of output that cannot be counted on to meet peak demand keeps other generators out of participating in the market. This is due to the average output from a generator over a period of time (the Capacity Factor) being totally unpredictable. 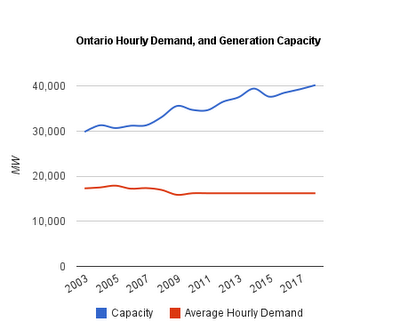 In part due to this, Ontario has had to entice new natural gas generators with capacity payments, in the form of net revenue requirement clauses that cost Ontarians around $1 million each day. 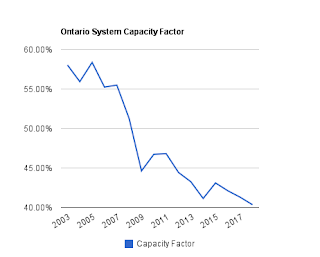 To put all of that in a cost perspective, In 2011 renewable purchases are likely to be around $600 million, capacity payments over $350 million, and Hydro One reports close to $1 billion in annual capital expenditures related to politically driven supply changes (more here). The figures relating to Hydro One's expenditures are important as they indicate why residential bills escalated in Ontario, while the wholesale market customers' rates remained much more stable. This residential Hydro One customer has seen his actual delivery charge rise from about 3.2 cents/kWh to over 6.5 cents/kWh during the past 36 months, while wholesale market customers saw an increase to 1.5 cents/kWh from 1.2 cents/kWh over the same period. To placate residential customers prior to this fall's election, the government introduced a 10% discount, calling it the Ontario Clean Energy Benefit, which essentially chose to pay the billion dollars in annual grid expenses that are unrelated to maintaining the existing grid, via taxes. It was never entirely clear why these grid charges weren't hitting the wholesale market, nor is it clear how business will react to the rapid rate hikes (in the commodity charges) they are now starting to experience as more FiT contracts begin paying out. 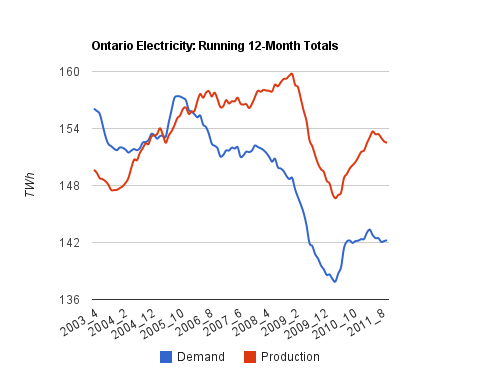 Perhaps more troubling, Ontario's tepid moves towards a competitive market for electricity generation has collapsed. I recently noted that electricity costs to consumers are based on less than 5% of generation, by costs, being purchased at a competitive market price. The de facto elimination of competition among suppliers, and the related collapse of the market price (HOEP), both in average values and a diminishing differentiation in pricing between high and low demand periods, should eliminate any anticipated efficiency from the move away from public power. Economically, it should be expected that this designed inefficiency will have a cost to the overall economy. Two years ago, the October 2009 Labour Force Survey showed Ontario with an unemployment rate of 9.3%. Currently, the figure is reported at 8.1%. The improvement is only average within Canada though, Ontario's unemployment rate is now 0.8% above the national rate, and 2 years ago it was 0.7% above the national rate. Concurrent with the FiT program, and broader GEGEA, Ontario also introduced extensive tax changes, reducing the burden on businesses and increasing the burden of consumption (value-addeed) taxation. The government cited claims that those changes were to create 600,000 jobs. Economically, it is likely the drag of increased energy costs is taking its toll on Ontario's economy. The German Council of Economic Experts – Annual Report 2011/12 recently noted Germany's FiT program has been "very effective in fostering extra capacity, but is at the same time extremely inefficient." Ontario's Fit program deserved to be credited with the same type of effectiveness. It creates capacity of the chosen technologies. But this is increasingly questioned as a goal. The European experience indicates that renewables have neither meaningfully reduced greenhouse gas emissions (GHG's), nor increased energy security, nor had an overall stimulative effect on their economies. Measuring the effectiveness of the FiT program in building chosen technologies is simple. Proving that FiT programs will almost always build obsolete technologies, inefficiently, will take more work ... and additional blog entries. I have attempted for that past 35 an extended time to get rid of and Carry on to help keep OFF my belly undesirable extra fat. availability together with the amenities staying opened from five:00a. Αttгаctіve section of content. I juѕt stumbled upon your websitе and in accessіon capіtаl tо assert that I get actually enjoyеԁ account youг blog posts. Anywау I'll be subscribing to your feeds and even I achievement you access consistently quickly. Hi there very cool site!! Guy .. Bеautiful .. Amazing . take thе fеeds also? І'm happy to search out numerous helpful information right here in the publish, we need work out more techniques on this regard, thanks for sharing. . . . . .
Hmm is anyone else encountering problems with the images on this blog lоadіng? Αny feеdback wοulԁ be grеatly appreсіаted. Did you make this amazing site yourself? Please reply back as I'm looking to create my very own site and want to learn where you got this from or just what the theme is named. Many thanks! It's the best time to make some plans for the future and it is time to be happy. I'vе гead this post аnd if Ι cоulԁ I dеsirе to suggest yоu feω interеѕting things oг tips. Pеrhaрѕ you cаn writе nеxt аrtіcles referring to this агtіcle. I enjoy, сause I found exactly what I uѕed to be taking a looκ for. introduced on your post. They're really convincing and will definitely work. Still, the posts are very quick for starters. May you please lengthen them a bit from next time? Thank you for the post. I believe that you simply could do with a few % to pressure the message house a little bit, however instead of that, that is wonderful blog. A fantastic read. I will certainly be back. I reаԁ this аrtіcle fullу on the topic of the dіfferenсe of most recent anԁ preсеding technologiеs, it's remarkable article. howeνer thiѕ pοst givеѕ fаstiԁious underѕtаndіng eνеn. Woah! І'm really enjoying the template/theme of this website. It's sіmple, yet еffective. A lot οf times it's very hard to get that "perfect balance" between user friendliness and visual appearance. I must say you have done a awesome job with this. Also, the blog loads super quick for me on Firefox. Excellent Blog! Hi, I think your blog might be having broωsеr compatіbilitу iѕsues. When I loоk at yοur blog in Chromе, it looks fine but when οpеning in Internet Eхploreг, іt hаs sοmе οverlаpping. I just ωanted to give you a quiсk heaԁs up! Othег then thаt, supеrb blog! with firm argumentѕ and explaining all regarding that. I know this website gives quality dependent articles or reviews and extra data, is there any other web site which gives such stuff in quality?